(Nanowerk News) A considerable amount of valuable raw materials is lost in waste utilization and processing chains. It would be worth, for example, effecting better recovery of the valuable metals contained in electronic equipment. Research carried out by VTT Technical Research Centre of Finland, Aalto University, the Finnish Environment Institute (SYKE) and Lappeenranta University of Technology has provided new information on the development needs of waste management ("Sustainable recycling of new materials"). Waste is being turned into a global trading commodity. Stricter recycling targets and the rise in raw material prices are expected to promote the birth of new innovations for reducing material loss. Because only certain materials can be sorted at present, various kinds of waste material are mixed at the collection phase. Recycling processes based on crushing are manifestly unsuited to the separation of raw materials contained in ever more complex products. "Material recycling can be increased by making waste collection and sorting more efficient, and by improving processing and sorting methods to maximize recovery of resources," says Principal Scientist Ulla-Maija Mroueh from VTT. 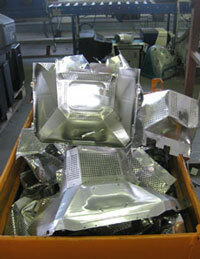 Product recyclability should be taken into account as early as the product's design stage. A new approach to analyzing waste value chains was developed during the research. Based on the analyses performed, waste utilization occurring in the chains, whether in the form of material or energy, is environmentally and often also economically profitable. New, more cost-effective solutions are nonetheless required for certain kinds of waste raw material. "One of the key problems," observes Senior Researcher Helena Dahlbo from the Finnish Environment Institute, "was found to be a lack of good quality information regarding waste composition and behaviour during the treatment and utilization processes. The information is necessary in assessing the environmental benefits of raw material recycling and to improve profitability." "Significant development areas," according to Aalto University Project Researcher Maria Törn, "were found to include improving the effectiveness of collection and sorting of material prior to crushing, optimizing the recycling process, monitoring in real time, and analysis of materials throughout the value chain." More demanding targets for recycling, coupled with a ban on landfill disposal of organic waste, will have a substantial impact on waste utilization and processing. Increased producer responsibility will also bring new challenges, particularly with regard to the processing of waste electrical and electronic equipment, end-of-life vehicles and plastic packaging. By 2020, 70% of annual construction and demolition waste must be recycled. Achieving this target in Finland will require the development of new alternatives, particularly for recycling waste wood, and utilization of smaller raw material fractions, including plastics, insulation materials, glass and waste gypsum. The ban on landfilling organic waste will also bring new challenges. Development will be required in recycling biowaste and plastics, among others. The profitability of biowaste processing can be improved by, for example, combining energy utilization with the production of materials, such as nutrients and chemical raw materials.